Three things that my family loves are Disney World, reality TV, and competition. So once a year during our summer Disney World vacation, we combine all of these together into what we affectionately call “The Amazing Race Around Disney World”. In case you aren’t familiar with the popular reality TV series “The Amazing Race“, the basic premise is that teams of two compete in challenges while racing around the world for a million dollars. We follow this same format (minus the million) and create new challenges each year. 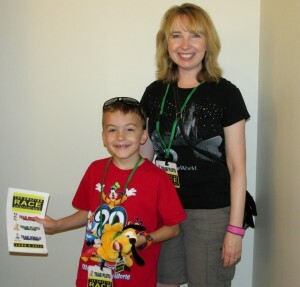 Please read on for a complete copy of one of our races and to learn more about how to create your very own “Amazing Race Around Disney World” for your next vacation! Creating our “Amazing Race Around Disney World” takes some prep work so we generally start putting it together about a month or two before our vacation. We begin by setting up teams. Teams of two work well for our race, because we generally travel with six people. You can adjust your team size for what will work best for your group. For our race, we like to have three teams so that there will be a first, second, and third place. Grandma and grandpa always make up one team, then my husband and I each partner up with one of our boys. In the interest of fairness, every year we switch up which child we are paired with. Depending on who you are traveling with, you can assign people to teams or even draw names from a hat. Of course, a team isn’t complete without a name. 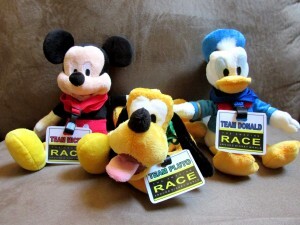 We like to stick with the Disney theme, so we have Team Mickey, Team Pluto, and Team Donald. 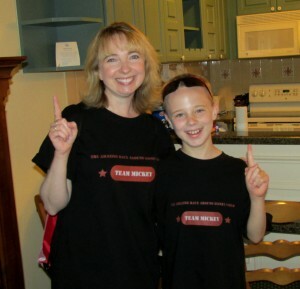 To get into the team spirit, we like to wear something special on “Amazing Race Around Disney World” day. We’ve worn everything from Disney shirts to homemade Amazing Race lanyards. You could even wear DisneyBounding style outfits to represent your team’s character name if you would like. All tasks must be completed and documented as noted (with photo, object, answer, etc.). Challenges may be completed simultaneously, but teammates may not split up. We are using the honor system; if a challenge requires you to experience an attraction, you must complete the entire attraction. You may ask other guests or cast members for help, but they may not complete your challenges for you. For each task skipped or completed incorrectly, a 20 minute time penalty will be added to that team’s arrival time at the Final Pit Stop. For any park skipped, a 90 minute penalty will be added to that team’s arrival time at the Final Pit Stop in addition to the per task penalty. The sky’s the limit on what you would like to choose for prizes. We’ve done lots of different things like Disney pins, medals, and plush animals. Think about what would appeal most to your group and choose prizes for first, second, and third place. Now this is where it gets really exciting! You can get creative and come up with any type of challenge that you can imagine. Over the years we’ve included several different tasks such as trivia, finding hidden Mickeys, riding attractions, and more. When creating your challenges you’ll want to consider who is participating and how long you want your race to last. Depending on how complicated your race, I like to make up booklets for each team that include all of the rules and challenge information. 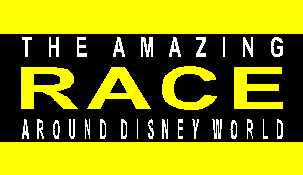 Now that we’ve taken a look at the basics, here’s an “Amazing Race” that my family completed: Please feel free to use it on your next Disney World vacation. For this particular version of the “Amazing Race”, we chose to only visit three parks – Magic Kingdom, Epcot, and Hollywood Studios. To be the first team to arrive at the Final Pit Stop Location in Downtown Disney after completing all of the required tasks. All teams will depart for the bus stop at 8:45am and will take the first available bus to the Magic Kingdom. Once at the Magic Kingdom, each team must complete the Road Block, the Detour and the Check Point. Once those tasks are completed, each team must take Disney Transportation to Epcot. Once at Epcot, each team must complete the Road Block, the Detour and the Check Point. Once those tasks are completed, each team must take Disney Transportation or walk to Hollywood Studios. Once at Hollywood Studios, each team must complete the Road Block, the Detour and the Check Point. Once those tasks are completed, each team must take Disney Transportation to Downtown Disney. Once at Downtown Disney, each team must complete the Road Block and proceed to the Final Pit Stop. The winning team will be the first team to arrive at the Final Pit Stop with all tasks completed (after any penalties have been assessed). Road Blocks and Detours may be completed simultaneously, but teammates cannot split up. You may ask Cast Members and other guests for help, but they cannot complete your challenges. Each player from the First Place team wins a 1st place medal and that team gets to choose which park we will visit that night. Each player from the Second Place team wins a 2nd place medal and that team gets to choose a dinner place for that night. Each player from the Third Place team wins a 3rd place medal and that team gets to choose a dessert place for that night. Ride Buzz LightYear’s Space Ranger Spin – At least one racer must score 5000 points or more. Document this by taking a photo of the score. Ride The Haunted Mansion – Document this by taking a photo of one racer doing their best impression of a hitchhiking ghost at the EXIT of the ride. Ride Pirates of the Caribbean – Document this by taking a photo of one racer doing their best pirate impression using props from the gift shop at the ride EXIT. Each team must find a total of 25 of the following scavenger hunt items. Document this by taking a photo of one racer with each item. Once your team has completed the Check Point, proceed to Epcot using Disney transportation. Ride The Seas with Nemo & Friends – Document this by taking a photo of one racer inside Bruce the Shark in the play area. Ride Journey Into Imagination With Figment – Document this by taking a photo of one racer jumping on the noise making squares after the ride. Ride Spaceship Earth – Document this by taking a photo of the globe with all the faces on it (get your faces in the photo if you can) at the EXIT of the ride. Each team must eat something in 3 different countries around World Showcase. The food items can be as small as candy or as big as lunch. They can be eaten by one or both racers. Document this by taking a photo of one of the racers eating each of the three things by something that represents that country (total of 3 photos required). While eating your way around World Showcase, both racers must color a Duffy at a Kidcot Funstop. 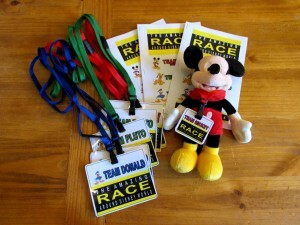 Then each racer must have their character stamped and have a cast member write “AMAZING RACE” on it in the language of the country in 3 different countries. Document this by bringing both racers completed Duffys to the Final Pit Stop. Once your team has completed the Check Point, proceed to Hollywood Studios using Disney transportation or on foot. Each team must find 2 of the following hidden Mickeys. Document this by taking a photo of each of the hidden Mickeys (total of 2 photos required). On Hollywood Boulevard, outside The Great Movie Ride, in Harry Anderson’s Square, look on the picture of the tie. On Hollywood Boulevard, outside The Great Movie Ride, in Carol Burnett’s Square, look for Mickey ears. In the gift shop as you exit Star Tours, a classic Hidden Mickey is formed of blue lights. It’s at the lower part of the counter to the right as you exit the ride. In Pizza Planet, a small, bright classic-Mickey star cluster appears above the counter registers on the right side of the rear wall. Look between the pizza-slice constellation and the comet. Near the Stage 1 Company Store, there are several Hidden Mickeys in the purple and yellow spilled paint splatters on the sidewalk outside the Muppet Store in Disney’s Hollywood Studios. At the Stage 1 Company Store, inside the store, high up on the mural, a Mickey hides in the clouds. In Pixar Place, there is a snack stand across from Toy Story Midway Mania. If you look behind the counter, you can see a profile shot of Mickey on the lower right of the huge popcorn box. Inside the Magic of Animation at the Animation Academy waiting area, there are a lot of circles on the carpet, but only every so often do they form a perfect Hidden Mickey. Outside The Magic of Disney Animation theater is a plaza with cement squares commemorating a few Disney Legends. Mickey is traced in Ward Kimball’s square. On the outside wall above the Hollywood Brown Derby restaurant, at the far upper right of the mural, a Mickey is in the clouds. Ride Star Tours – Document this by taking a photo of one racer doing their best Star Wars impression using props from the gift shop at the EXIT of the ride. See Muppet Vision 3D – Document this by taking a photo of one racer wearing their 3D glasses. Do The Animation Academy – Document this by bringing both racers completed character sketches to the Final Pit Stop. Once your team has completed the Check Point, proceed to Downtown Disney using Disney transportation. Each team must buy 2 pins that represent their team mascot (Team Pluto – buy Pluto pins, etc.). These pins must be purchased in Downtown Disney. Document this by bringing the 2 pins and receipt to the Final Pit Stop. After your team has completed the Final Pit Stop, feel free to relax and enjoy a snack or shopping while you wait for the other teams to arrive. To give you an idea, this “Amazing Race” took our family about five hours to complete from start to finish. We range in age from early elementary school kids to retired seniors. Everyone was able to keep up, but most of us were exhausted by the end. We ran this race in June so the heat, humidity, and crowds were certainly a factor. The “Amazing Race Around Disney World” is meant to be fun and not grueling, so through the years we’ve made adjustments based on how intense of a race our traveling group can handle. This year we’ll be changing it up and doing an “Amazing Race Around World Showcase” that I’m working on right now. If you get the chance to add a little of this kind of Disney magic to your vacation, I highly recommend it. Our races are some of our most cherished Disney memories! Have you ever done a challenge at Disney World? Please leave a comment, we would love to hear about it! I love this idea! A new way to tour! My family of 4 boys would have a blast with the completion aspect! There is a 100% chance that I will do this at some point. My family are Amazing Race fans anyway and I even set up something similarly crazy for TouringPlans during the first 24-hour day. Saw this and immediately thought of you guys, haha. What a fantastic idea!! I would LOVE to do this with my family. Thanks so much. I hope you get the chance to enjoy a race with your family! I love this idea and all the thought you put behind this. I want to do this the next time I go to Disney! Thanks for sharing! Back around 2000 and for several years at the annual RADP meet in December, either a giant scavenger hunt or race type event was organized. Usually all 4 parks, Downtown Disney and several hotels were involved. I remember a test involving water from the Wilderness Lodge pool, finding room numbers in the Contemporary tower and finding out what was in a monorail yellow. It was amazing fun. Wow, Kevin, that sounds amazing! Adding the resort hotels is a great idea. I’ll have to remember that for our next “Amazing Race”. My DD17 and I are coming up with a photo scavenger hunt, but this seems just as awesome. I hope it’s ok if I integrate a few of the things for our trip next week. We are looking at doing a 4 parks in one day and this may play well into it. Thanks for the inspiration and creativity! Love it! This is awesome. For my 40th birthday, my wife put together an Amazing Race around our hometown for me and my friends. I would love to do something similar in WDW! Thanks for posting. I also love the idea of a Disneyland race! That would be fantastic. This is hysterical and we can’t wait to try it. Please share your world showcase race! Hope you have a great time doing the race! I’ll see about doing a Part 2 post later this summer once we’ve completed our “Amazing Race Around The World Showcase”! Nice idea. One question-any ideas for adding Animal Kingdom challenges? 1. Have someone take a picture of a one of the racers with a certain animal in the background (person creating the race choose the animal). 1. Each team must find and take photos of at least five different live animals. 2. Each team must earn three Wilderness Explorer badges of their choice. 3. Each team must play the Fossil Fun Games and win one prize. Awesome post!I would love to do something similar in WDW! Thanks for posting and sharing with us!! 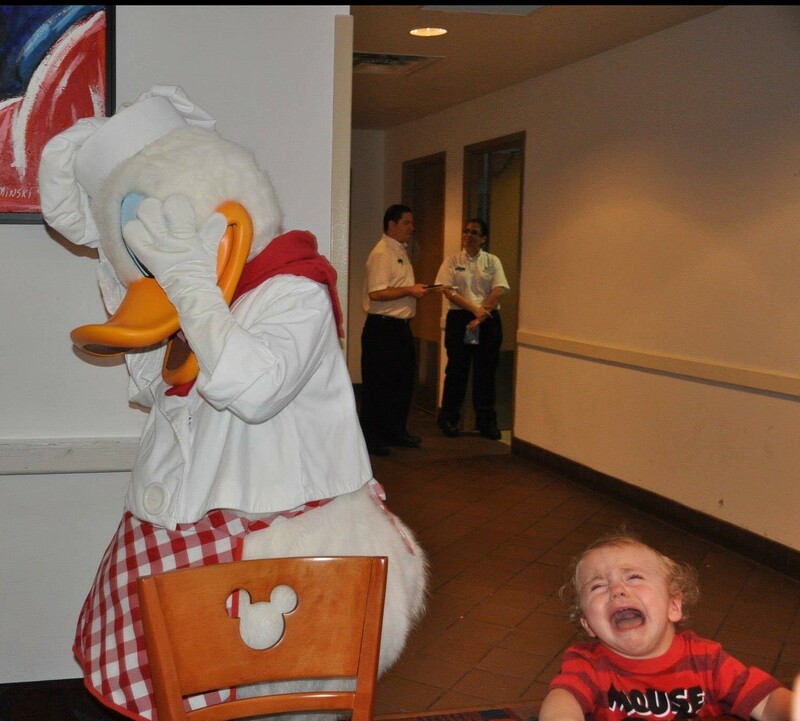 I would check with Disney before doing this. I seriously doubt this is condoned in the parks. These types of competitions could easily get out of control. First, we always make sure that our challenges will not interfere with other guests or cast members. Our tasks only include things that any visitor would do like taking photos (no flash! ), shopping, eating, drinking, finding hidden Mickeys, coloring a Duffy, riding attractions, etc. We don’t want our fun to ruin someone else’s experience in any way. Second, we have had many guests as well as cast members (including Security Officers at the entrance of Hollywood Studios) ask us about the race and comment on what a great idea it was. In our experience, we only received very positive feedback. Third, remember for everyone’s safety running is not allowed in the parks. Sounds great fun. Seeing as there are only 5 of us, I guess there would be 2 teams of 2 and that leaves me to have a day to myself and greet the winners back at DTD. Sweet.